November 21, 2018, 10:14 a.m. In last week’s column I wondered whether this year’s John Lewis Christmas advert would take a different direction, in order to prevent any suggestion its campaigns were losing their edge. Certainly, this year’s edition, which features a sentimental journey through pop-superstar Elton John’s career, is a departure from previous incarnations. At the end of the advert – which is set to his classic hit ‘Your Song’ - an infant Elton unwraps his very first piano, whereupon John Lewis suggests that ‘some gifts are more than just a gift’. 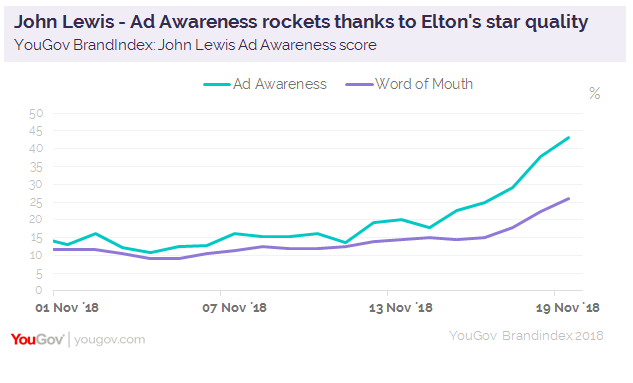 YouGov BrandIndex data indicates that John Lewis’ Ad Awareness score (whether someone has seen or heard an advert for a brand in the last fortnight) has climbed sharply since the campaign’s release. Its rating has jumped from 22% to 43% - a rise of 21%. Similarly, the retailer’s Word of Mouth score (which measures if someone has discussed a brand with a friend, colleague or family member) has also grown significantly, from 16% to 25%. 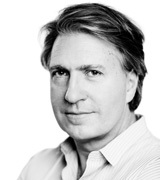 Its overall Ad Awareness is higher right now than any other brand that has released a Christmas campaign. It also has the highest level of Ad Awareness uplift among any brand YouGov tracks. It should be noted at this point, that some big brands have scaled back on Christmas campaigns this year. These figures are broadly in line with last year’s – and show a similar level of Ad Awareness uptick. Perhaps its scores could have been even more impressive had its launch day not clashed with news surrounding the Brexit deal and cabinet resignations, which diverted news attention away from the retailer. The choice of Elton John not only adds star quality, but plays well with John Lewis shoppers. YouGov Ratings data indicates that two thirds (66%) of those that would consider shopping at John Lewis have a positive opinion of Elton, compared to 58% of the public more generally. After this successful launch, John Lewis will be hoping to maintain this momentum into the Christmas period, which is even more crucial this year owing to the difficult high-street retail situation.